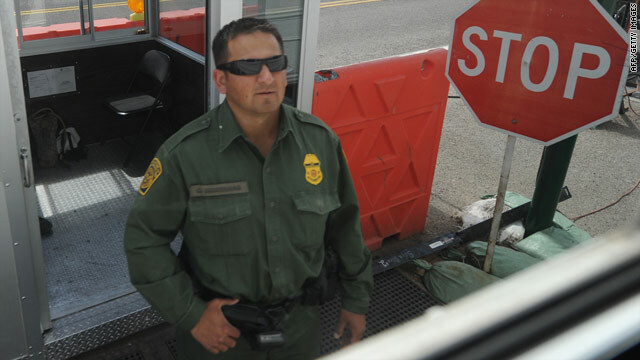 A Border Patrol officer inspects vehicles this week at a checkpoint in Tombstone, Arizona, near the Mexican border. (CNN) -- Arizona Gov. Jan Brewer on Friday signed the state's immigration bill into law. It is considered to be among the toughest legislation in the nation. What does the Arizona law do? Arizona's law orders immigrants to carry their alien registration documents at all times and requires police to question people if there's reason to suspect they're in the United States illegally. It also targets those who hire illegal immigrant laborers or knowingly transport them. Are other states considering similar legislation? Michael Hethmon, general counsel for the Immigration Reform Law Institute, helped draft the language of the Arizona bill. Hethmon said lawmakers from four other states have approached him asking for advice on how they can do the same thing where they live. He declined to identify which states, citing attorney-client privilege. State laws relating to immigration have increased in recent years, according to the National Conference of State Legislatures. In 2005, 300 bills were introduced. The next year, that number nearly doubled, and in 2007, more than 1,500 bills were introduced. Another 1,305 were introduced in 2008, and about 1,500 were considered in 2009. About 15 percent of those were enacted, dealing with issues such as driver's licenses, health and education. About 1,000 bills have been brought up so far this year. Critics, including immigrant advocates and the American Civil Liberties Union of Arizona, say they are concerned the law will foster racial profiling, arguing that most police officers don't have enough training to look past race while investigating a person's legal status. Is federal immigration legislation coming? Democrats tell CNN that if they don't get Republican commitments soon, they likely will push to move a bill without GOP support. Democratic sources said the chances of passing immigration reform in that scenario this year are slim, but they want to make clear to key constituencies they are at least trying. President Obama is still pushing for a bill, though. Sen. Lindsey Graham of South Carolina is the only GOP senator on board, but he has told Democrats they will lose his support unless they find another Republican. Obama recently called Sen. Scott Brown, R-Massachusetts, to try to get him on board, a Brown spokeswoman said. On Thursday, Sen. Jeff Sessions, R-Alabama, said in a statement that during tough economic conditions, Americans are "dubious" about immigration reform. He said the White House and Congress should not immediately take up the issue -- but instead "take targeted steps to deal with the crisis at the border, increase the usage of the E-Verify program, and enhance prosecutions of employers who knowingly hire illegal workers." The last immigration reform efforts in Congress were in 2005 when Sen. John McCain, R-Arizona, and the late Sen. Ted Kennedy, Brown's predecessor, introduced a bipartisan bill that aimed to implement guest-worker programs and ways for more illegal immigrants to become citizens. The McCain-Kennedy bill, however, never came up for a vote in the Senate. Other legislative efforts have failed to gain momentum. CNN's Dana Bash, Ed Hornick and Kristi Keck contributed to this report.